There are two conflicting sources for this article: Coruscant Nights II: Street of Shadows and Star Wars Galaxies. Content approaching. Blue Shadow Virus, Mystery of a Thousand Moons, Children of the Force–class. "Captain Typho—you worry too much!" Captain Gregar Typho was a Human male who served as head of security for Senator Padmé Amidala during the Separatist Crisis and Clone Wars. A quiet, simple man native to the backwater world of Naboo, Typho made a name for himself as a Junior Palace Guard during the Battle of Naboo in 32 BBY, in which he fought with distinction, suffering several injuries including the loss of his left eye. Typho then became the personal bodyguard and security advisor for Padmé Amidala in 24 BBY when she abdicated the throne and became a Senator; he inherited the position from his uncle, Quarsh Panaka, who served as Typho's mentor for much of his life. Typho quickly fell in love with the Senator, but he knew their social castes were too different for any relationship to form. When Amidala's life came under threat in 22 BBY, Typho's paranoia of an assassination attempt coinciding with the Senator's visit to Coruscant to vote on the Military Creation Act saved her life, when a decoy handmaiden was killed in her place. Typho continued to serve Amidala during the Clone Wars, traveling on several diplomatic missions for her. In 19 BBY, Amidala went to Mustafar to find her husband, Jedi Knight Anakin Skywalker—and never returned. A mourning Typho attended her funeral, feeling guilty for having let her go to Mustafar in the first place. He ultimately decided to travel to Coruscant to find her killer and avenge Amidala's death, but it was months before he could get leave from his duties. During this time, he worked with former Jedi Ferus Olin against the Empire on Naboo. A year after the Declaration of a New Order, Typho finally made it to Coruscant, and eventually came to the conclusion that Amidala had been "killed" by Darth Vader, Dark Lord of the Sith. Typho lured Vader into a trap and tried to kill him, but the Sith's command of the Force was too strong for him, and Vader killed Captain Typho. Gregar Typho was born over a decade before 32 BBY on the planet Naboo. He was a stocky Human, powerfully built and very athletic. His uncle, Quarsh Panaka, was a high-ranking officer in the Royal Naboo Security Forces, and Typho hoped to follow in his footsteps and serve as a guard to the planet's monarch. He was raised in the shadow of the Royal House of Naboo, and eventually got his chance to join the Security Forces, traveling to a number of offworld academies that Panaka had attended in the years prior, where he was given a rigorous training. He became a Junior Palace Guard, and by 32 BBY had served for a number of years with courage and distinction, despite his youth. Around the same time, Panaka became the head of the Security Forces and personal bodyguard of Queen Padmé Amidala after the death of King Veruna. Six months later, the Trade Federation blockaded Naboo and eventually launched an invasion force. Amidala, a staunch pacifist, ordered that Typho and his peers to stand down and offer no opposition, though many carried out resistance in secret. Panaka and the Queen fled Naboo with the help of Jedi Obi-Wan Kenobi and Qui-Gon Jinn, though they returned with the intention of overthrowing the Trade Federation. While the Gungan species occupied the bulk of the Trade Federation's forces at the Battle of the Great Grass Plains, Panaka, the Queen, and the Jedi returned to liberate the capital city of Theed. Typho, still a teenager, fought alongside his uncle, helping to repel the Trade Federation and capture its Neimoidian leaders. He showed courage and tenacity in the line of fire, sustaining many injuries including the loss of his left eye. Because of an accident of genetic programming, he was unable to use an eye cloned from himself, and had to make use with an eyepatch, which limited his vision. Typho gained much notoriety for his efforts in the battle, and when Amidala stepped down as Queen and became the Senator of the Chommell sector in 24 BBY, Typho was appointed as her head of security, earning the rank of captain. Many accused Typho of using his family connections to secure the position, though he had earned it on merit alone: Panaka did not make the decision to select him. Typho took his duty seriously and proved a diligent security chief, but he quickly grew to love Amidala. Knowing that their social castes were too different for them to ever become lovers, he kept his feeling secret. Amidala trusted Typho completely, though she often ignored his advice and treated him poorly. The former queen's term coincided with the Separatist Crisis, and a dangerous time for the Republic. The Confederacy of Independent Systems, led by former Jedi Master Count Dooku, was persuading many systems to secede from the Republic, and although she was relatively new to politics, Amidala became an important figure for the Republic. As a result, Typho felt the likelihood of any assassination attempts would only increase, and went about establishing as stringent security measures as he could. He adopted many of his uncle Panaka's most innovative practices, including using Amidala's handmaidens as decoys while she donned the attire of a handmaiden or pilot. In 22 BBY, Palpatine scheduled a vote on the hotly debated Military Creation Act to take place in the Senate two months later. Amidala intended to travel to Coruscant and oppose, though for a time beforehand she returned to her family on Naboo. Typho accompanied her, and got to see much of his uncle, who had retained his position during Queen Jamillia's reign. Together, they began planning Amidala's travel and security arrangements for the trip to Coruscant; though the Senator was exasperated by this, as the journey was over a month away, Panaka and Typho believed she could be targeted by those who supported the vote. While spending time together, Typho and Panaka learned that the Trade Federation—who had managed to avoid any real punishment for their activities on Naboo ten years earlier—had thrown their lot in with the Confederacy, as had a number of other commerce guilds. They found Amidala speaking with her sister, Sola Naberrie, and reported the news to her. The group spoke for a while, with both Panaka and Amidala angered by the actions Trade Federation Viceroy Nute Gunray, and with the former concerned that with the Trade Federation and the Separatists, who had used violence before, in cahoots, her safety could be greatly compromised. The usually silent Typho interjected, because he felt that, with Amidala a strong opponent of the proposed Republic military that would clash with the CIS, Dooku might actually consider her an ally. She was angered that Captain Typho would consider her friendly with a man who wished to dissolve the Republic, but when he explained his position properly, she was unable to refute it. Panaka, however, believed that the Senator was likely to be targeted by the Confederacy, even if only to appease her old enemies, the Trade Federation. Amidala was adamant that she would travel to Coruscant anyway, and, knowing she would not be persuaded otherwise, Typho and Panaka left her to continue their security planning. Over a month later, Typho and Panaka approved a plan to transport the Senator to Coruscant. A decoy, one of Amidala's handmaidens, would wear her dress garb and take her place aboard the Senator's cruiser, while Amidala herself would pilot one of the N-1 starfighter escorts, along with Typho and Porro Dolphe, who would each fly their own fighters. The plan worked as expected, but there initially seemed to be no danger; the cruiser landed without incident, and the decoy Senator began to disembark. Typho met with the real Amidala on the landing pad, expressing his apologies for the unnecessary security measures. Just then, however, the cruiser exploded; Typho and Amidala were caught in the blast and sent hurtling to the ground, but were uninjured. However, the explosion had killed much of the staff and guards aboard the ship, including the decoy Senator, Cordé. Typho and Amidala rushed to check if there were any survivors, though there was none, and the chief of security quickly spirited her away, in case the would-be assassins tried again. Typho is "persuaded" to go to Ilum by Grand Master Yoda. The resilient Amidala wanted to address the Senate and vote anyway, and Typho accompanied her and Associate Planetary Representative Jar Jar Binks to the Grand Convocation Chamber. They arrived just as Supreme Chancellor Palpatine, who had already pushed the vote back a day in light of the security concerns, mourned her death to the Senate, and although Amidala made a statement about the assassination attempt, the vote did not take place that day. Typho later left the Senator to meet with Palpatine and the Loyalist Committee; during the meeting, the Senator, who was convinced that Dooku was behind the attack, was ordered by Palpatine to take on two Jedi to provide security and stop any subsequent assassination attempts. Typho went to Amidala's apartment to establish the security there, setting up a control center in the lower levels and posting a guard on each floor. Before the Jedi were due to arrive, Typho tried to convince the Senator that the situation was far more dangerous than she realized, to no avail. Typho, Binks, and Amidala greeted the Jedi—Obi-Wan Kenobi and his Padawan, Anakin Skywalker—and he told them of his fears that Amidala was not taking the threat of further attacks on her seriously enough. The captain was relieved to see the Jedi, as he was unsure if his own limited forces could cope with what could happen. After a short discussion between the Senator and the Jedi, Typho informed Kenobi of his security arrangements after the Senator retired for the night, and Kenobi later inspected Typho's work for himself. The next attack came during the night: two poisonous kouhuns were infiltrated into Amidala's chambers, though the Jedi were able to kill them before the creatures struck. Kenobi and Skywalker then pursued the assassin, Zam Wesell, through the lower levels of Coruscant, though she was ultimately killed by another bounty hunter, who had sub-contracted her. Upon learning of the second attack, the Jedi High Council decided that Amidala should return to Naboo, disguised, along with Skywalker, while a decoy would remain on Coruscant. The Senator grudgingly agreed, and Dormé was selected to act as the decoy. Typho remained on Coruscant at the false Senator's side, both to ensure the charade looked as genuine as possible and to offer protection should the assassins strike again. Typho and Dormé saw Amidala and her protector off as they boarded a refugee ship bound for Naboo, before returning to the apartment. Representative Binks would take Amidala's seat on the Senate, and Typho acted as his bodyguard during the Gungan's address to the Senate. Binks had been taken advantage of by the keen mind of Palpatine's aide, Mas Amedda, who tricked him into proposing that the Chancellor be given emergency powers that would allow him to unilaterally pass the Military Creation Act and use a newly discovered clone army from Kamino to attack the Separatist headquarters on Geonosis in the Outer Rim—something which Amidala would have been completely opposed to. Although Typho knew this, he did nothing and allowed Binks to make his motion, which was passed: the clone army was subsequently used in the Battle of Geonosis, beginning the galaxy-wide Clone Wars between the CIS and the Republic. "M'lady, don't do anything dangerous. You are the representative of your people in a time of great crisis." "All the reason to help them any way I can." "Please, m'lady. Just leave the heroics to the Jedi and the clone army." Typho retained his post for the duration of the Clone Wars, and often accompanied Amidala on journeys in one of her ships. During one such journey, when they were traveling with Jedi Master Yoda on a mission for the Republic, they received a distress signal sent by Jedi Luminara Unduli and Barriss Offee from the planet Ilum, which was near to Amidala's ship's location. Unduli and Offee had been ambushed by Separatist forces while searching for Ilum crystals on the iceworld, and Yoda felt that if they were not rescued promptly, they would be killed. The Jedi Master suggested that they halt their current mission and travel the short distance to Ilum, though Typho was quick to interject, telling Yoda that they could not risk Senator Amidala's life. He also felt the ship was unsuitable for such a search and rescue mission, and that their current mission was far more important. Yoda, however, would not be persuaded, and he claimed that it would be but a slight detour—they could still complete their mission afterwards. Yoda eventually used the Force to affect Typho's mind and trick the Naboo man into agreeing with him. Amidala wanted to follow Yoda's suggested course of action anyway, so she made no attempts to stop him using the Force to influence the captain. She then ordered Typho to plot the most direct course to Ilum, and they eventually arrived and set down on the planet's frigid, icy surface. Yoda ordered Typho, Amidala, and her two droids to remain on the ship while he sought out the two trapped Jedi. Yoda did not return for some time, but Typho and Amidala both kept watch with electrobinoculars. Yoda was supposed to have contacted the ship by that time, and Amidala had a bad feeling about the situation. Speculating that the ship's communication array might have been damaged by Ilum's harsh winds, he left Amidala to check on it. While he was inside the ship, though, Amidala took her two droids and fled in pursuit of Yoda. They eventually returned, along with Offee and Unduli, and Amidala was unharmed. Typho and Senator Amidala on a mission to Bri'ahl. Later in the war, Typho accompanied Amidala on a diplomatic mission to a backwater world called Bri'ahl, though a number of clone troopers were also posted on the planet. Amidala was attempting to persuade President Vuul to side with the Republic during the conflict, though the majority of Bri'ahlians were steadfastly neutral in the conflict. Some rebels, however, had sided with Dooku and hatched a plan to assassinate Vuul and Amidala in the President's palace while disguised as clone troopers. At the same time, Amidala's two beloved droids, C-3PO and R2-D2, went missing and some of Vuul's staff went to look for them. Typho and his own security men learned of the assassination plot, but ultimately did not have to foil it; although he did not know exactly how, the terrorists had been killed at their forest camp. C-3PO and R2-D2 had in fact inadvertently set off a number of explosives in the camp, killing the would-be assassins, and Vuul's men soon retrieved them and returned them to Amidala's possession. Some time later, Amidala was invited to a reception on Coruscant by a wealthy Senator named Drexx, along with her friends and fellow Senators Mon Mothma and Bail Organa, as well as the latter's aide, Sheltay Retrac. Typho accompanied them to the entrance, though he wasn't permitted to the reception proper. Amidala had long suspected Drexx of taking bribes from the Separatists, and Typho was worried that she would confront him and put herself in danger. Before they parted, he warned her not to do anything dangerous, though she told him that he worried too much. Neither Amidala nor Retrac heeded his advice, however, and together they procured evidence of Drexx taking a bribe from Passel Argente's uncle. The two women later presented the evidence to Typho and Bail Organa, and intended to act on it. In 19 BBY, Typho acted as a chauffeur for the secretly pregnant Amidala, who was spending more time on Coruscant in an effort to reduce Chancellor Palpatine's power. Soon thereafter, the Separatists launched a full scale assault on Coruscant, while Typho was with Amidala and her droids in the Senator's high-rise apartment. A missile struck the building on their floor, greatly damaging the structure, though no one was injured. Typho wanted to whisk Amidala to safety immediately, but she made him evacuate the building first, saving the lives of many beings. Several days later, the Jedi Temple was attacked and many Jedi wiped out; almost immediately after, Amidala was visited by the Jedi Obi-Wan Kenobi, one of her close friends. After Kenobi departed, Amidala decided to travel to the planet Mustafar, on a mission so secret even Typho could not accompany her. He attempted to persuade her otherwise, to no avail, though when she informed him that she would be with Jedi Knight Anakin Skywalker, her secret husband, he reluctantly abated, believing Skywalker could offer her adequate protection. That was the last time Typho saw Amidala alive. She perished at some point on her mission, and Typho felt personally responsible for her death; he believed he had failed in his duty, and that he should have been at her side on Mustafar. Distraught, he returned to Naboo to attend her funeral, where she was mourned by the entire planet. After the funeral had ended, he milled around the crowds without aim, dwelling over his past mistakes and wondering how things might have turned out if he had accompanied Amidala. Eventually, he decided to put his self-flagellations behind him and look to the one thing he could do for the late Senator: avenge her. Anakin Skywalker had gone missing after the mission, and reports on Amidala's death were quite spotty. Using his rank to gain extra privileges, Typho investigated her death further, though nearly every report told a different story. One thing they were in agreement on, though, was that Amidala had suffered some form of strangulation shortly before she passed away, with damage to her trachea and larynx and a fractured hyoid bone. Strangely, however, there was no damage or bruising to the exterior of her throat, and it was in pristine physical condition. Putting two and two together, Typho concluded that the damage had been inflicted through the Force; Skywalker, a Force-sensitive, had been with Amidala close to the time of her death, and Typho believed that even if the young Jedi was not personally responsible for her murder, then he was somehow linked. 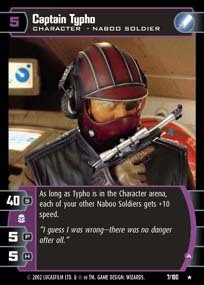 Typho made it his mission to travel to Coruscant, track down Skywalker, learn who had killed Amidala, and avenge her. Before he could do so, however, he had a number of administrative duties to attend to. A year after the Empire was established, Typho remained with the Naboo Security Forces, working in Keren. He was no friend of the Empire, unlike his Moff-to-be uncle, and didn't believe the reports that Padmé had been killed by the Jedi. He worked to set up a spy network to keep an eye on the Imperial occupation, even as the Empire sought to spy on Naboo Royal Security. Six months after Amidala's death, Typho would be called upon to assist Ferus Olin in his plan to catch Inquisitor Malorum, and to, at least temporarily, remove the Imperial presence on Naboo. While Olin fought Malorum, Clive Flax and Trever Flume went to work on setting up the Imperial explosives cache to explode and destroy both the Theed Hangar and Imperial headquarters, Typho, with the assistance of the Erased, fought the stormtrooper garrison in the streets of Theed. "No one sent me. I am Captain Typho of Naboo, formerly of the Senate Security Council. I am here on my own. No agency or individual has sanctioned my undertaking." Following the Malorum affair, Typho was finally given leave from his duties on Naboo, and he made his way to Coruscant—now restyled as Imperial Center—post haste. He traveled on a Carrack-class light cruiser, though Typho was too consumed by his mission to notice or use the privileges allowed to him because of his rank. By the time the cruiser had set down on Coruscant's surface, Typho, overwhelmed by the mass of teeming life and existence surrounding him, began to have doubts about the likelihood of him finding Amidala's killer among the trillions who inhabited the planet. However, the thought of the late Senator resting uneasily in her grave spurred him on to continue his quest, and he made searching the ruins of the Jedi Temple his first objective. Although the temple's ruins had been cordoned off from the public by the Empire, Typho used his rank to get clearance, and he searched the Temple for some time, looking for any scrap of information that could point towards the identity of Amidala's killer. However, the Temple Library were mostly destroyed, with both physical and digital information either corrupted or damaged; despite his skills as a slicer, Typho was able to salvage only a small amount of the data, none of it helpful. Believing he had wasted more precious time, Typho began to leave the ruins, though as he did so he heard the sound of footsteps. Aurra Sing, a notorious bounty hunter, was herself conducting a search, though she did not seem to notice Typho. Deciding that Sing's presence was unrelated to his mission and none of his business; as he prepared to sneak off into the night, she sprang, jumping at Typho and pointing her lightsaber at his throat. Sing questioned Typho, asking him why he was in the Temple and who sent him. He answered truthfully, but knowing that the bounty hunter would kill him once she discerned he was of no use to her, he crushed a datastick he was holding, creating a dazzling light which temporarily blinded Sing. Typho used the momentary advantage to kick Sing's lightsaber from her hand and into his, and he was able to use the weapon to gain the upper hand in the fight. Sing's incapacitation didn't last very long, and she quickly drew a second lightsaber she had been keeping on her person. The two locked blades, though Typho knew that his rudimentary knowledge of the lightsaber would pale in comparison to Sing's honed abilities, and he attempted to fall back, swinging the stolen blade wildly until he found himself backed up against a wall. Sing announced that she had come to the Temple in the hopes of finding Jedi Knight Jax Pavan for Darth Vader, and that she would kill Typho. In a last ditch attempt to save himself, the Naboo man feigned a slash with his lightsaber and severed the biocomputer antenna on Sing's head—the resulting electromagnetic shock sent her into spasms of pain. Typho was tempted to kill the helpless Sing, but remembering what his uncle Panaka had taught him and what Amidala had stood for, he showed mercy and left her in the Temple while he moved on to pursue another avenue of finding Anakin Skywalker. Typho traveled to the former business complex which housed Coruscant's civil service divisions the next day, eventually arranging an appointment with a mid-level Jenet bureaucrat after filing an enormous amount of paperwork. Typho hoped the Jenet would be able to learn if Skywalker still lived; he knew he'd be helped in this regard by his knowledge of Jenet greeting customs, which were unlike those of most sentient species: upon meeting, Jenets usually insulted each other. The bureaucrat was impressed by Typho's knowledge, and the two spent some time exchanging banter; when Typho cut to the chase and began his inquiry, however, the Jenet informed him that the Emperor had decreed that looking up information about the Jedi was evil. Typho played the sympathy card, telling the other sentient that the people of Naboo still mourned their former queen's death and wanted closure, and the Jenet eventually swayed and agreed to allow Typho to access the Imperial records of all individual Jedi. He found Skywalker's entry, which confirmed the young Jedi Knight had perished on Mustafar; however, no mention was made of Amidala or exactly how Skywalker had perished were present. Typho concluded that Skywalker's death had been covered up by someone, and that only someone truly versed in the ways of the Force—perhaps even a Sith—had killed him. After the leaving the civil service complex, he decided that his next course of action would be to learn if any Sith Lords had visited Mustafar on the day of Amidala's death. He learned of a Cragmoloid information broker named Boulad; if anyone could gain access to the Sith's travel records, it was him. Typho bribed a Nikto who knew of Boulad's location and traveled there, gaining an audience with the infochant after a minimum of fuss. His knowledge of obscure species proving useful once again, Typho first engaged Boulad in a conversation about the Cragmoloid's family to endear himself to him, before paying Boulad five thousand credits for the knowledge that a certain Darth Sidious had been on Mustafar that day. "Padmé. Padmé Amidala. The woman I loved from afar, for years. She… never knew. She was too busy, too deeply engaged in the… service of her people to notice me. And I attended to my duty—I, Typho, captain of Naboo. But I… loved her. And now… now she's dead. Dead. You killed her, Vader. You! I know it!" Typho eventually came to the conclusion that Darth Vader, a Sith Lord and Imperial enforcer, had killed Anakin and Amidala on Mustafar, though he did not know that Vader and Anakin were actually one and the same person. He began to contemplate ways of killing Vader, though came up with none; the Sith Lord was extremely talented in the ways of the dark side of the Force, and had constant security while on errands for the Empire. Reaching him would be virtually impossible, actually killing him even more so. Typho remembered that Sing had been searching for Jax Pavan on behalf of Vader, and thought that if he could capture Pavan and present him to Vader, he would have a chance to attack the Sith. Typho considered Pavan's fate to be a small price to pay for vengeance for Amidala. Eventually, after going through numerous bureaucratic and underworld connections, he was able to trace that Darth Sidious had been present on Mustafar after Amidala had arrived there, and also discovered that Darth Vader had been responsible for her death. By claiming he had captured Pavan, Typho was able to lure Vader to an abandoned warehouse and attempted to assassinate the Sith, but was easily defeated. In his final moments, as he lay dying, Typho claimed that he knew Vader had "killed" Amidala, and took pleasure in the pain that her name caused Vader before he expired. Typho was played by Jay Laga'aia in the movies, and voiced by André Sogliuzzo in the 2003 Clone Wars TV series and James Mathis III in the 2008 show. As seen in early storyboards of Attack of the Clones, Typho was originally intended to be gunned down by droidekas upon waving goodbye to Amidala. This idea, however, was then dropped and Typho was thus spared. His first name was unpublished for four years, since his first appearance in Attack of the Clones (2002), until publication of The Last of the Jedi: Death on Naboo (2006). Coruscant Nights II: Street of Shadows states that Typho dies in 19 BBY, yet he appears in Star Wars Galaxies, which takes place almost two decades later, sometime following the Battle of Yavin. It should be noted that Typho was added to the game in 2005, three years before the novel's release in 2008. It should also be noted that in his appearance in Star Wars Galaxies, Captain Typho does not appear to have aged at all since his last appearance in Star Wars: Episode III Revenge of the Sith. He is missing his signature eye-patch and instead is wearing a set of anniversary goggles (a type of eye-wear given for players during the 4th anniversary of Star Wars Galaxies) and you can very clearly see the "injured" eye behind the clear lens (eye-patches did not exist within the game). However the NPC is very clearly named "Typho." Wookieepedia has 19 images related to Gregar Typho. Wookieepedia has 3 audio files related to Gregar Typho.